one will meet with a success unexpected in common hours." One reason for the variety of RV lifestyles I've already described is the almost-unlimited variety of places you can park or camp in a recreational vehicle. That's the subject of this entry. I'll describe some of those options, outline Jim's and my general game plan for our "summer" and "winter" trips, give you some suggestions for setting priorities re: where to stay and for how long, and explain why I contend "there is no free camping." Hint: it's kinda like the concept "there is no free lunch." Where to stay for one night or many can be a dilemma for full-time and extended-travel RVers, even seasoned folks like us who've tried most of the options over the years. There are just so many choices! That's generally a good thing, but sometimes making decisions can get a bit overwhelming. This no-fee boondocking site on National Forest Service land near Silverton, CO has a pit toilet. Options range from "free" parking overnight at a Walmart store or longer-term on national forest or BLM land . . . to exclusive RV resorts with golf courses, Olympic-sized swimming pools, and other amenities for the well-heeled traveler. And within every price range there are endless variations of public, private, and military campgrounds. 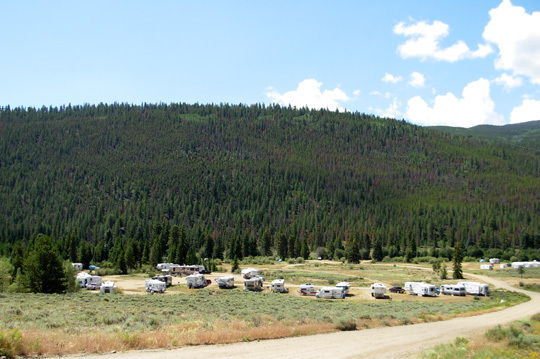 Services vary widely, too, from "boondocking" (dry camping without any hookups) to full hookups that include water, electricity, sewer connections, and possibly even WiFi or cable connections at a site. The fewer the hookups, usually the lower the cost. Next add to the mix all the different discount cards available (national parks passes, senior passes, state park passes, etc.) and camping clubs (Good Sam, AAA, Escapees, Thousand Trails, etc.). Some of the cards and memberships might save you a lot of money. Depending on your personality, using them can either simplify or complicate your decisions of where to stay! We've had Good Sam and AAA memberships but haven't used either for private campgrounds in a while because we much prefer to stay in public and military campgrounds. And the annual Texas State Park pass is a real bargain for us since we spend so much time there each year. Between the discount camping coupons and the money we save on $4-5 per person daily entry fees, we've usually got that $60 recouped in less than a week. A. For one-nighters in transit from Point A to Point B, we usually park "free" at a Walmart or Sam's Club parking lot near the freeway. 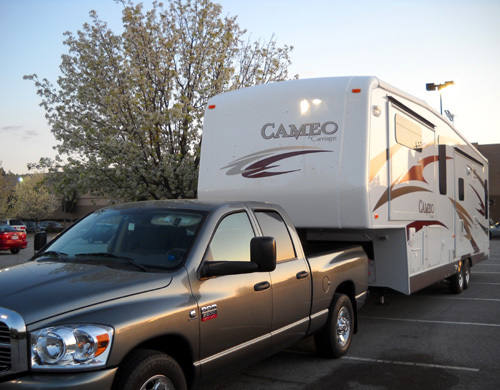 Most of them allow RVers to stay overnight, especially if you ask nicely and spend some money in the store. We joke that those "free" nights sometimes cost $50 or $100 when we're loading up on groceries and supplies! We've occasionally parked at Flying Js and rest areas that allow overnight parking but not in the last few years. One time we got permission from a Cabella's to stay in their huge lot. Although we've never parked overnight at a Cracker Barrel store, I've read that they are RV-friendly, too. 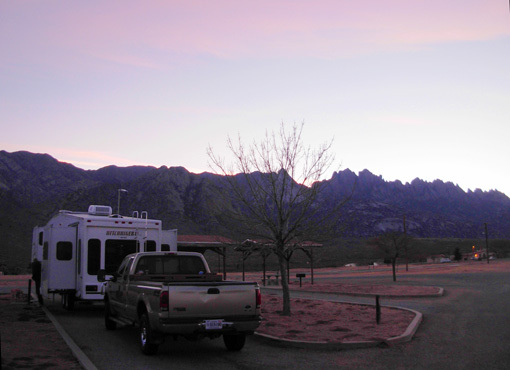 Some small towns also allow RVers to park free or for a low fee in their city parks. You really gotta be careful if you pick a boondocking spot after dark. Invariably we discover we're very close to a railroad track -- or worse. One time we parked overnight on an isolated dirt road near Crater Lake and discovered, about 4 AM, that it was a busy logging road! The trucks barely missed our camper before we hurriedly got dressed and moved to a safer location. For more information about boondocking, check Bob Difley's blog periodically. Click on the archives link for previous entries he's written about no-fee camping. Leadville, CO; in 2007 we paid $4 for a permit that was good for up to 14 days. 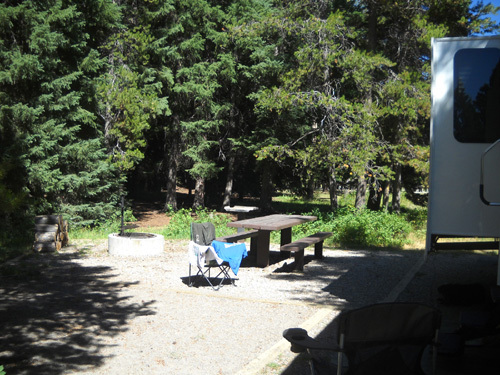 2) National forest campgrounds that have a table, grill, etc. but no or minimal hookups; these usually run about $10-$15 per night, or half off with a senior pass from the national parks system. 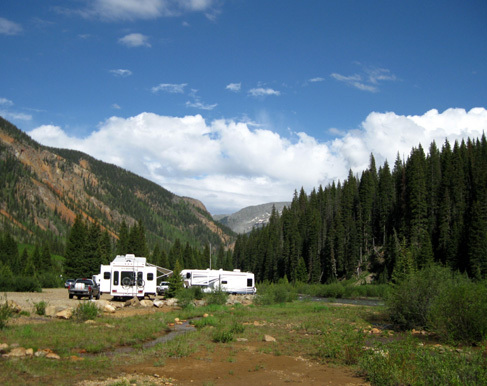 We've used this NFS campground at Kenosha Pass, CO several times. 3) FamCamps at military posts/bases -- Jim's retired Army National Guard. These usually have full hookups + WiFi and are $10-$20/night. Some have less expensive weekly or monthly rates. 4) Local, regional, state, and national park campgrounds. Most offer sites with partial or full hookups. Prices at public campgrounds are almost always cheaper than private campgrounds, even if you don't have a discount pass. With some types of passes you come out even better. 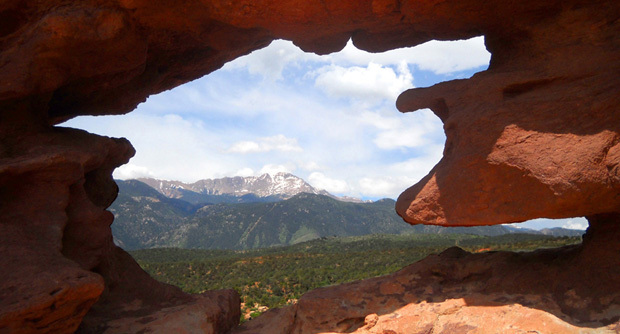 The National Parks Senior Pass for people over 62 allows free entry into any national park and half-price camping at those parks and national forest campgrounds. Our favorite state parks are in Texas. 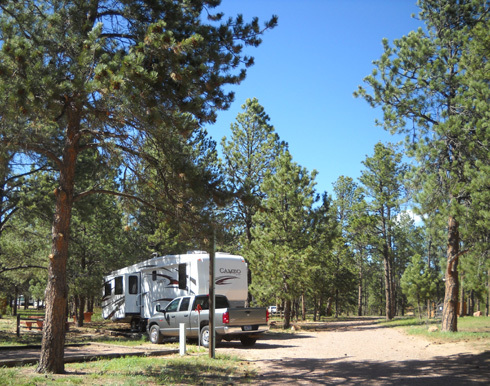 The state has a large park system with RV camping at reasonable rates. The $60 annual pass gives you free entry into all the parks (daily per person entry fees are usually $4-5), four half-price coupons for camping, and other discounts. Those are just two examples. 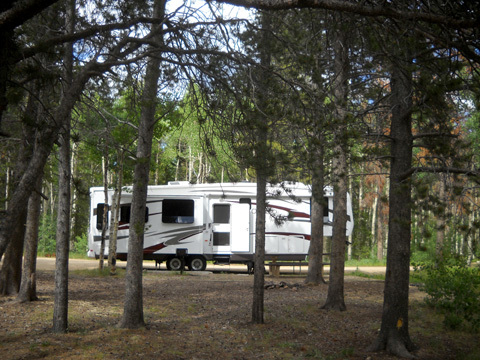 Many public campgrounds have a two-week limit but that suits our lifestyle pretty well. We move around a lot to races. If the campgrounds aren't full, we can usually extend our stay another week or two if we ask. We've also done some "camping" on friends' and family members' properties while visiting them. 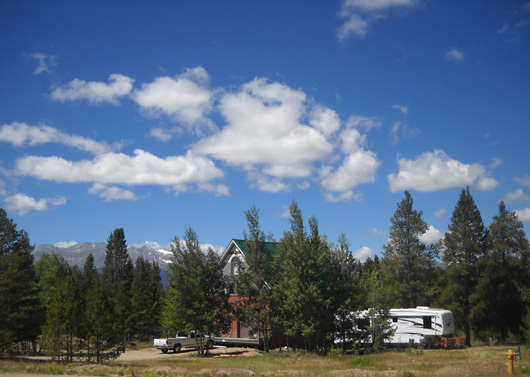 We have a convenient arrangement with a friend in Leadville, CO, for example, where we park next to his business and hook up to his water and electricity for 2-3 weeks around Leadville Trail 100 race time. We reimburse him with generous gift certificates, so it's not really "free:"
We seldom camp at a private campground. They are usually too expensive for us, even with a Good Sam or AAA membership, and we don't use all their amenities like pools, playgrounds, etc. 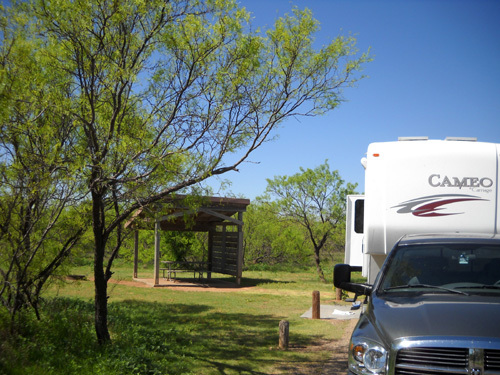 We sometimes find good weekly, two-week, or monthly rates at private campgrounds, however, so we don't rule them out entirely. Some even offer attractive seasonal rates. When figuring out where to stay as you're traveling, first prioritize what you need/want at each destination or interim stop-over. What's most important -- cost? location? specific hookups? space? campground amenities? nearby services? nice scenery? peace and quiet? You also have to consider whether your rig is set up for boondocking (dry camping with no utilities). Do you have a generator and gasoline to run it? solar panels? propane? adequate water in the tank? Or will you need water, electrical, and/or sewer hookups? 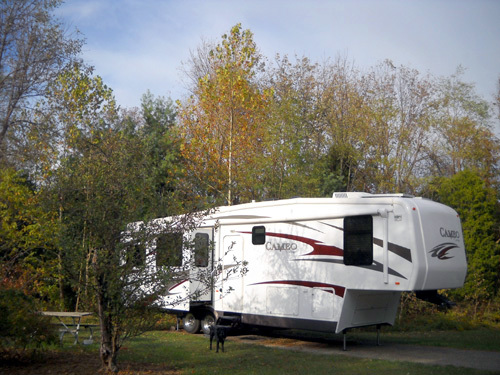 East Lake SP in southwestern Ohio has plenty of room for RVs in the fall. Our priorities frequently change depending on the purpose of the stopover. One night at a well-lit, noisy Walmart parking lot next to the freeway is fine (for one night!) when we're in transit from one place to another but it won't work for us any longer than that. Even if it did, it's not kosher to "camp" at Walmart, only to park there overnight. Ditto for Sam's Club, which is usually quieter at night when the store is closed but just as bright. Did I tell you about the time a street sweeper woke us up at 5 AM when he was cleaning the parking lot right next to us?? Sam's managers have never turned us down but one had to see our RV before giving permission to park overnight; she wanted to make sure we weren't derelicts, I suppose. If we're going to be somewhere for several weeks, at minimum we'll want to have accessible potable water, a site large enough to have some privacy, a grocery and other stores we need within a certain distance, internet connectivity (and TV, if possible) -- all at a cost we deem reasonable. As long as we have some sun for our solar panels and access to water, gasoline (generator), and propane (oven, stove, refrigerator, furnace, portable heater), we're able to boondock for quite a while. I've put "free" camping in quotes a few times because almost any arrangement for which we don't pay a fee to camp is rarely completely free of any cost. Let me explain . . .
solar panels, inverter, etc. 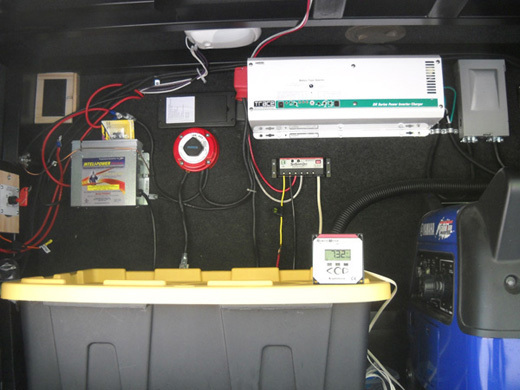 that Jim installed; any additional equipment like this that you add to your RV has initial and ongoing costs. on box is installed inside the camper. Jim installed two solar panels on the roof, too. In addition, without a sewer connection you may sometimes have to pay to dump grey and black water properly (we hunt for free places at truck stops, interstate rest stops, etc.). Some places charge for potable water or ask for a donation. And if a friend or relative lets you park on their property and hook up to their electricity and water at no charge, it's only "free" if you're too cheap to give them something in return! In those arrangements we've given gift certificates, money, thank-you gifts, and/or bartered our time or expertise in exchange for the privilege. 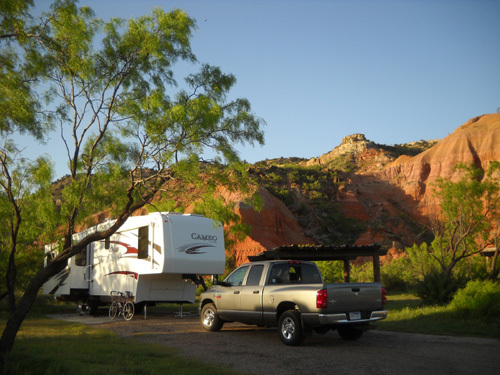 Figuring out where to camp is both fun and a challenge to extended-travel and full-time RVers. I recommend sampling many different types of places all over the country or region where you'll be traveling, as much for the experience as to learn which sorts of campgrounds suit you best. You might be surprised by finding a gem of a place. We were happy to find this gem: the FamCamp at the USAF Academy in Colorado Springs. About half the time Jim and I return to camping areas we've enjoyed before. That's easiest, of course; we know what we're getting. We also like the mystery surrounding new places we've never seen, the joy of discovery. I can't see us settling into one campground or RV park for an entire season until we've outgrown our more inquisitive, restless phase of traveling. 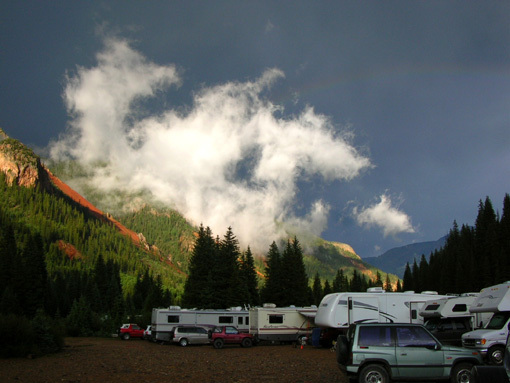 No matter your intended RV lifestyle, you have lots of interesting camping choices. Have fun!